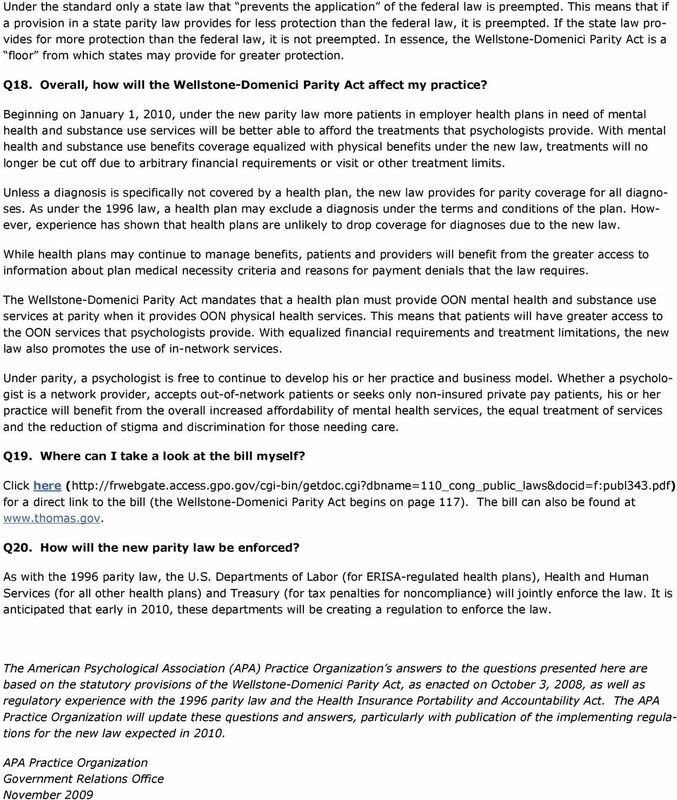 Download "The Wellstone-Domenici Mental Health Parity Act Frequently Asked Questions"
1 The Wellstone-Domenici Mental Health Parity Act Frequently Asked Questions The Paul Wellstone and Pete Domenici Mental Health Parity and Addiction Equity Act was enacted into law on October 3, This publication provides answers to questions from psychologists about the Act and what it means for professional psychology. Q1. What does the new federal parity act do? The Paul Wellstone and Pete Domenici Mental Health Parity and Addiction Equity Act (The Wellstone-Domenici Parity Act ) will end health insurance benefits inequity between mental health/substance use disorders and medical/surgical benefits for group health plans with more than 50 employees. Under this new law, a group health plan of 50 or more employees that provides both physical and mental health/ substance use benefits must ensure that all financial requirements and treatment limitations applicable to mental health/substance use disorder benefits are no more restrictive than those requirements and limitations placed on physical benefits. This means that equity in coverage will apply to all financial requirements, including lifetime and annual dollar limits, deductibles, copayments, coinsurance and out-of-pocket expenses, and to all treatment limitations, including frequency of treatment, number of visits, days of coverage and other similar limits. Q2. What does mental health and substance use parity mean? Mental health and substance use parity means that benefits coverage for mental health and substance use benefits must be at least equal to that coverage provided for physical health benefits. In other words, all of the financial requirements and treatment limitations applied to mental health and substance use benefits may be no more restrictive than for physical health benefits. Historically, health plans have applied higher patient cost-sharing and more restrictive treatment limitations to mental health and substance use benefits than for physical benefits. This new law ends this practice. Q3. How is this new law different from the 1996 federal parity law? The Wellstone-Domenici Parity Act amended and substantially increased the mental health benefits protection afforded under the federal Mental Health Parity Act of 1996, which only required parity coverage for lifetime and annual dollar limits and did not apply to benefits for substance use disorders. Q4. When does this new parity law take effect? The Wellstone-Domenici Parity Act will apply to health plans beginning January 1, (The effective date is slightly different for labor union plans pursuant to collective bargaining agreements.) This will give health plans the time necessary to redesign their coverage to come into compliance with the new law. The current 1996 parity law will remain in effect through Q5. Which health plans will have to comply with the new parity law? 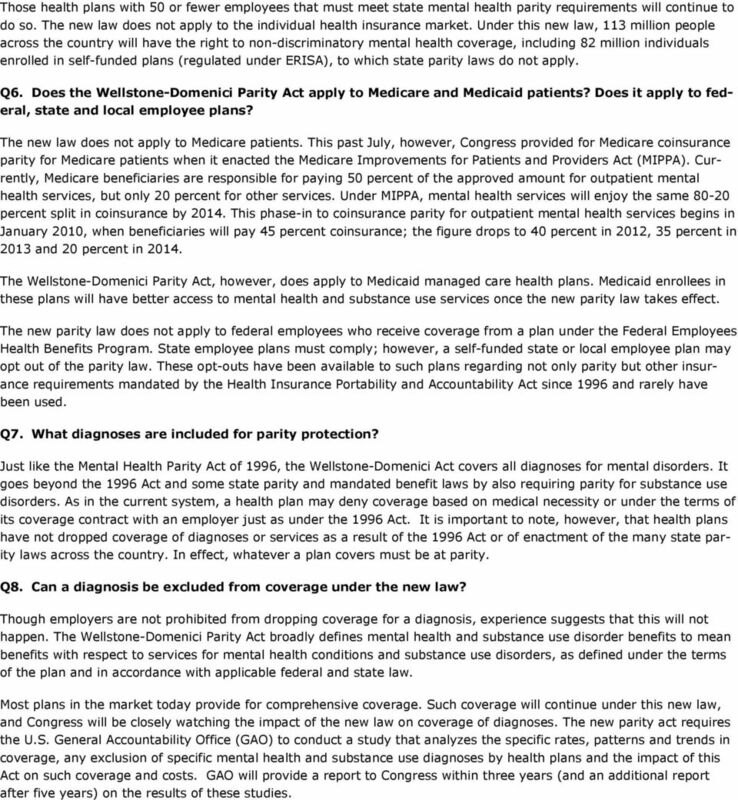 The Wellstone-Domenici Parity Act applies to all group health plans with 50 or more employees, whether they are selffunded (regulated under ERISA) or fully-insured (regulated under state law), that provide mental health or substance use benefits. About 97 percent of these plans provide some mental health or substance use benefits now. 2 Those health plans with 50 or fewer employees that must meet state mental health parity requirements will continue to do so. The new law does not apply to the individual health insurance market. Under this new law, 113 million people across the country will have the right to non-discriminatory mental health coverage, including 82 million individuals enrolled in self-funded plans (regulated under ERISA), to which state parity laws do not apply. Q6. Does the Wellstone-Domenici Parity Act apply to Medicare and Medicaid patients? Does it apply to federal, state and local employee plans? The new law does not apply to Medicare patients. This past July, however, Congress provided for Medicare coinsurance parity for Medicare patients when it enacted the Medicare Improvements for Patients and Providers Act (MIPPA). Currently, Medicare beneficiaries are responsible for paying 50 percent of the approved amount for outpatient mental health services, but only 20 percent for other services. Under MIPPA, mental health services will enjoy the same percent split in coinsurance by This phase-in to coinsurance parity for outpatient mental health services begins in January 2010, when beneficiaries will pay 45 percent coinsurance; the figure drops to 40 percent in 2012, 35 percent in 2013 and 20 percent in The Wellstone-Domenici Parity Act, however, does apply to Medicaid managed care health plans. Medicaid enrollees in these plans will have better access to mental health and substance use services once the new parity law takes effect. The new parity law does not apply to federal employees who receive coverage from a plan under the Federal Employees Health Benefits Program. State employee plans must comply; however, a self-funded state or local employee plan may opt out of the parity law. These opt-outs have been available to such plans regarding not only parity but other insurance requirements mandated by the Health Insurance Portability and Accountability Act since 1996 and rarely have been used. Q7. What diagnoses are included for parity protection? Just like the Mental Health Parity Act of 1996, the Wellstone-Domenici Act covers all diagnoses for mental disorders. It goes beyond the 1996 Act and some state parity and mandated benefit laws by also requiring parity for substance use disorders. As in the current system, a health plan may deny coverage based on medical necessity or under the terms of its coverage contract with an employer just as under the 1996 Act. It is important to note, however, that health plans have not dropped coverage of diagnoses or services as a result of the 1996 Act or of enactment of the many state parity laws across the country. In effect, whatever a plan covers must be at parity. Q8. Can a diagnosis be excluded from coverage under the new law? Though employers are not prohibited from dropping coverage for a diagnosis, experience suggests that this will not happen. The Wellstone-Domenici Parity Act broadly defines mental health and substance use disorder benefits to mean benefits with respect to services for mental health conditions and substance use disorders, as defined under the terms of the plan and in accordance with applicable federal and state law. Most plans in the market today provide for comprehensive coverage. Such coverage will continue under this new law, and Congress will be closely watching the impact of the new law on coverage of diagnoses. 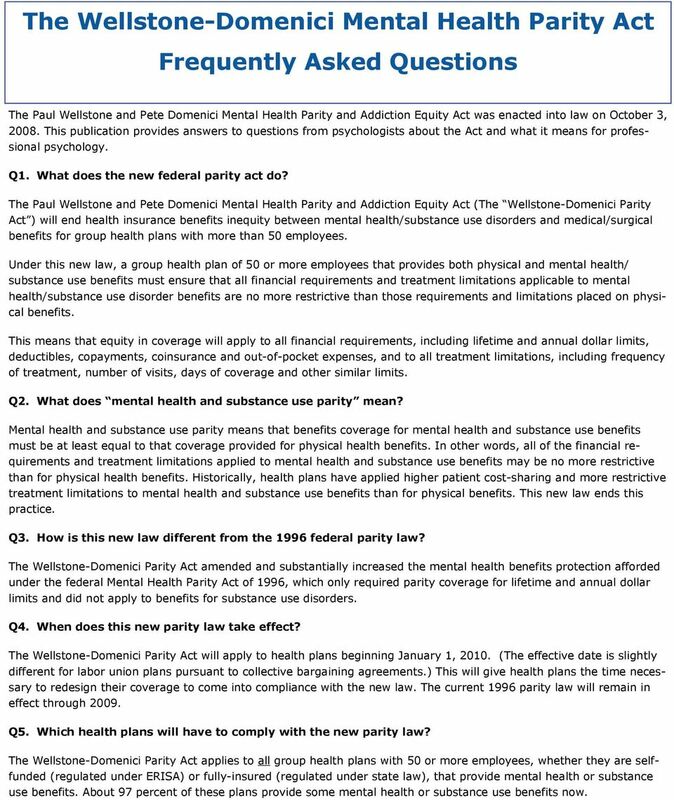 The new parity act requires the U.S. General Accountability Office (GAO) to conduct a study that analyzes the specific rates, patterns and trends in coverage, any exclusion of specific mental health and substance use diagnoses by health plans and the impact of this Act on such coverage and costs. GAO will provide a report to Congress within three years (and an additional report after five years) on the results of these studies. 3 Q9. Does this new parity law have any impact on benefits management and medical necessity criteria? 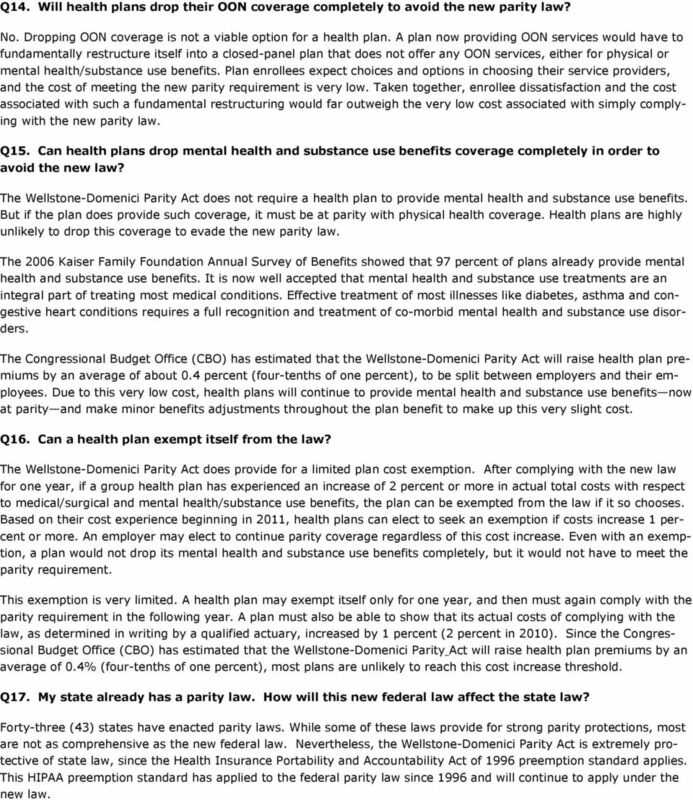 Just as under the 1996 Mental Health Parity Act, under the Wellstone-Domenici Parity Act a health plan may manage the benefits under the terms and conditions of the plan. Some health plans may react to the new parity requirement by increasing benefits management. The new law goes beyond the 1996 law by requiring a plan to make mental health/substance use disorder medical necessity criteria available to current or potential participants, beneficiaries or providers upon request. A plan must also make reasons for payment denials available to participants or beneficiaries on request or as otherwise required. Q10. Does the Wellstone-Domenici Parity Act apply to the out-of-network (OON) services that I provide? Yes. Under the new law, if a health plan provides both OON physical and mental/substance use disorder benefits, these services must be provided at parity. If a plan currently provides only OON physical benefits, this new law will require it to add OON mental health/substance use disorder benefits, at parity. A few health plans, typically referred to as closed panel or staff model HMOs, do not provide for any OON coverage. Since these plans do not provide OON physical coverage, they are not required to provide OON mental health/ substance use coverage. Q11. How will the new parity law financially help patients who use OON providers and can psychologists continue to balance bill for OON services? Patients choosing mental health or substance use providers OON will see that their health plan pays a greater portion of the cost. Example 1: A psychologist provides psychotherapy office visits on an OON basis for a patient whose health plan currently excludes OON mental health and substance use coverage but provides OON medical office visits with 80 percent of the visit paid by the plan. The psychologist charges $100 per session. Prior to the new parity law, the health plan paid $0, while the patient paid $100. Under the new law, the plan must now cover the OON psychotherapy visit at parity with OON medical office visits. The plan will now pay $80 for the visit, while the patient is responsible for $20. Example 2: A psychologist provides psychotherapy office visits on an OON basis for a patient whose health plan currently reimburses 50 percent of its payment for OON mental health services, but reimburses 60 percent of its payment for OON medical office visits. 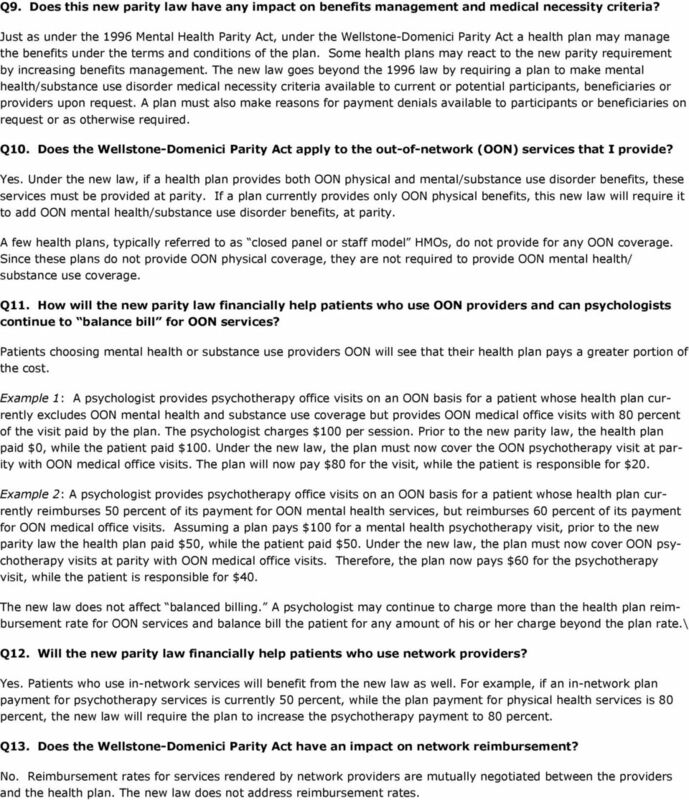 Assuming a plan pays $100 for a mental health psychotherapy visit, prior to the new parity law the health plan paid $50, while the patient paid $50. Under the new law, the plan must now cover OON psychotherapy visits at parity with OON medical office visits. Therefore, the plan now pays $60 for the psychotherapy visit, while the patient is responsible for $40. The new law does not affect balanced billing. A psychologist may continue to charge more than the health plan reimbursement rate for OON services and balance bill the patient for any amount of his or her charge beyond the plan rate.\ Q12. Will the new parity law financially help patients who use network providers? Yes. Patients who use in-network services will benefit from the new law as well. For example, if an in-network plan payment for psychotherapy services is currently 50 percent, while the plan payment for physical health services is 80 percent, the new law will require the plan to increase the psychotherapy payment to 80 percent. Q13. Does the Wellstone-Domenici Parity Act have an impact on network reimbursement? No. Reimbursement rates for services rendered by network providers are mutually negotiated between the providers and the health plan. The new law does not address reimbursement rates. 4 Q14. Will health plans drop their OON coverage completely to avoid the new parity law? No. Dropping OON coverage is not a viable option for a health plan. A plan now providing OON services would have to fundamentally restructure itself into a closed-panel plan that does not offer any OON services, either for physical or mental health/substance use benefits. Plan enrollees expect choices and options in choosing their service providers, and the cost of meeting the new parity requirement is very low. Taken together, enrollee dissatisfaction and the cost associated with such a fundamental restructuring would far outweigh the very low cost associated with simply complying with the new parity law. Q15. Can health plans drop mental health and substance use benefits coverage completely in order to avoid the new law? The Wellstone-Domenici Parity Act does not require a health plan to provide mental health and substance use benefits. But if the plan does provide such coverage, it must be at parity with physical health coverage. Health plans are highly unlikely to drop this coverage to evade the new parity law. The 2006 Kaiser Family Foundation Annual Survey of Benefits showed that 97 percent of plans already provide mental health and substance use benefits. It is now well accepted that mental health and substance use treatments are an integral part of treating most medical conditions. Effective treatment of most illnesses like diabetes, asthma and congestive heart conditions requires a full recognition and treatment of co-morbid mental health and substance use disorders. The Congressional Budget Office (CBO) has estimated that the Wellstone-Domenici Parity Act will raise health plan premiums by an average of about 0.4 percent (four-tenths of one percent), to be split between employers and their employees. Due to this very low cost, health plans will continue to provide mental health and substance use benefits now at parity and make minor benefits adjustments throughout the plan benefit to make up this very slight cost. Q16. Can a health plan exempt itself from the law? The Wellstone-Domenici Parity Act does provide for a limited plan cost exemption. After complying with the new law for one year, if a group health plan has experienced an increase of 2 percent or more in actual total costs with respect to medical/surgical and mental health/substance use benefits, the plan can be exempted from the law if it so chooses. Based on their cost experience beginning in 2011, health plans can elect to seek an exemption if costs increase 1 percent or more. An employer may elect to continue parity coverage regardless of this cost increase. Even with an exemption, a plan would not drop its mental health and substance use benefits completely, but it would not have to meet the parity requirement. This exemption is very limited. A health plan may exempt itself only for one year, and then must again comply with the parity requirement in the following year. A plan must also be able to show that its actual costs of complying with the law, as determined in writing by a qualified actuary, increased by 1 percent (2 percent in 2010). Since the Congressional Budget Office (CBO) has estimated that the Wellstone-Domenici Parity Act will raise health plan premiums by an average of 0.4% (four-tenths of one percent), most plans are unlikely to reach this cost increase threshold. Q17. My state already has a parity law. How will this new federal law affect the state law? Forty-three (43) states have enacted parity laws. While some of these laws provide for strong parity protections, most are not as comprehensive as the new federal law. Nevertheless, the Wellstone-Domenici Parity Act is extremely protective of state law, since the Health Insurance Portability and Accountability Act of 1996 preemption standard applies. This HIPAA preemption standard has applied to the federal parity law since 1996 and will continue to apply under the new law. FLORIDA: Frequently Asked Questions About the Autism Insurance Reform Law. What does the Florida Autism Legislation (Senate Bill Number 2654) do? MISSOURI. 2. When did the law requiring insurance companies to cover services for children with autism spectrum disorder go into effect? Request for Comment #1 How common is the use of stop-loss insurance in connection with self-insured arrangements?